Kidministration: Where Does Your Time Go? You probably got into kids ministry because you have a passion for communicating the truth of God’s Word to children. People who are drawn to careers in kids ministry are often gifted at leading classroom sessions that center around teaching, storytelling, creative facilitation of crafts and hands-on learning activities, and building relationships with children. Chances are you feel a sense of calling to kids ministry because you have been bestowed with the gift of communication and connection with kids, and when you work within your giftedness you are energized. When gifted teachers transition into full-time kids pastors, however, many discover that the job they believed would be exhilarating is exhausting instead. Most in this category do not know exactly why they feel unsatisfied, but I have a theory. I believe many kids pastors struggle with dissatisfaction because they spend only a small portion of their time interacting with children. It is important to take an eyes-wide-open approach that lets you see where your time goes. The best way to do this is to keep a daily log of your activities, noting how much time each task takes, and then assess what you find. Performing a time study will help you see what you are currently doing, and it will help you identify areas that are taking more time than they should, and others that need more of your attention. Begin by taking a few moments to evaluate your typical work week using estimations from memory using this list of task categories. How many hours per week do you spend in each of these areas? Feel free to add to this list or remove categories as you like. You can do this on paper, but I recommend using a spreadsheet (like Google Sheets or Microsoft Excel) so you can generate a chart to visualize the results. Set up your spreadsheet like this, and enter your time estimates in hours per week. In this example, the leader maintains a 50-hour week, and spends half that time doing purely administrative work. Just three hours per week (only 6% of this leader’s job) is spent interacting with children. If this person is motivated by teaching kids and drained by administrative work, they will no doubt feel some amount of frustration in the role. By adjusting the number of categories in your list, you can see more or less detail. Both views can be useful. For instance, a view of the same data that shows time with children and not with children looks like this. If this leader got into ministry because she had a teaching gift, but does not also have an administrative one, she may be spending as much as 95% of her week working outside her giftedness. It is understandable that this might be a depleting effort. So what can you do? Here are four tips to help you find more satisfaction in your work week. Be aware of the reality. 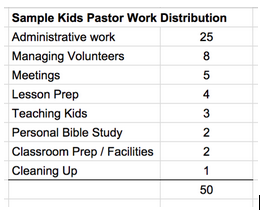 The notion that there is more to children’s ministry than teaching is, in fact, a fact. What happens in the classroom during service times is like the tip of the iceberg. Few people are aware of how much work happens behind the scenes. 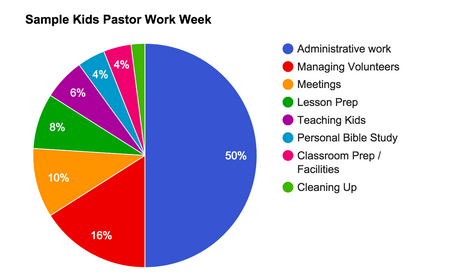 As a kids pastor, you need to be eyes-wide-open aware that the biggest part of your job will be done between Sundays. Adjust your expectation. The next step is to adjust your expectation in regard to what your job “should” be like. 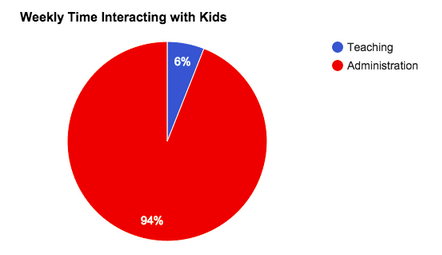 In a 40+ hour workweek you will likely spend less than 4 hours interacting directly with kids. As ministries grow, many kidmin professionals find that they spend less and less time interacting directly with kids; some do not teach at all. Instead of thinking of yourself as a teacher of kids, think of yourself as a teacher of teachers and a leader of leaders. This mentality allows you to view your role in the proper perspective; you are a multiplier. That’s the job. Take control of your calendar. You can alter the balance of where your time goes by taking greater control over your calendar. Instead of reacting to each need that arises through the day, take a proactive posture on your work week. Schedule your work for each day, block time on your calendar for each task you need to take on, and stick to your schedule. If a job takes more time than it was allocated, add more time somewhere else. By planning your work and working your plan you will find that you can feel a greater sense of control over your time. Lean into administration. There is much more to kids ministry than teaching. Administration is leadership. It involves vision casting, goal setting, strategic planning, coordination of communication, training of leaders, and management of resources. Success in these areas will greatly increase the effectiveness of what happens during your teaching times. 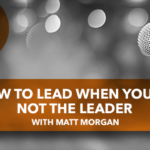 By learning to love the administrative side of your job, you will find that you can grow the influence, effectiveness and efficiency of your ministry exponentially. When you do have the opportunity to teach kids directly, focus your attention on that special time and enjoy it to the full.